Selecting the right fibre and resin for a project is an important part of achieving the mechanical goals that the designer is looking to achieve. Matching the type of fibre, resins and curing process can have a huge impact on how the component wets out and the resulting ultimate tensile strength of the component. 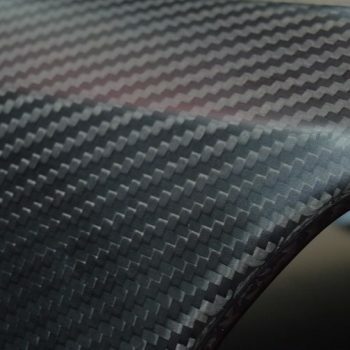 See “Fibre Selection” below to see a full list of carbon fibre filaments available from Toray and their properties. SCC offer some detailed manufacturing know-how, on how to resolve pin-holes in certain situations (if requested by the client) and trimming ballistic fibres. If you’d like to find out more about what type of materials might best suit your project, click here to get in contact and we’d be happy help. 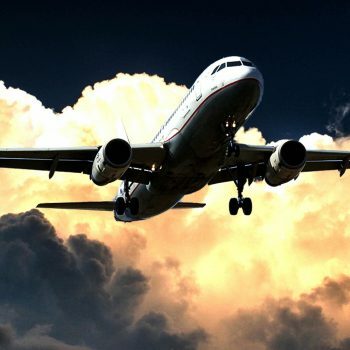 Selecting the right resin system and type of carbon fibre is an important balance in achieving the right ultimate tensile strength, strain characteristics, impact resistance and ability to wet out and in some cases availability. With a vast array of ‘pre-preggers’ and ‘weavers’ to choose from, all specifying their own standard line materials, of which manufacturers suggest cannot be mixed. Material selection is a careful task. Below we have some advice and know-how based on our years of experience in manufacturing and working with clients on variety of high value manufacturing projects with a huge array of different applications. Very even distribution of resin throughout the material, resulting in highly consistent wet out and consolidation of the component. An accurate and consistent fibre to weight ratio throughout the material, which lends itself to processes that require high pressure manufacturing and materials that are in the lower percentages of resin content. Highly customisable material; pre-pregs can be very accurately made to order, to the customers’ requirements, selecting the type of resin, weave and fibre. There are a large number of fibre types available on the market, the majority being made by two Japanese companies, Toray and Mitsubishi. Fibre selection works synonymously with the type of resin and process being used to make the final component. If there is not a good match with material and process, this can completely invalidate the potential mechanical advantages of using a higher specification fibre, due to dryness or poor consolidation. 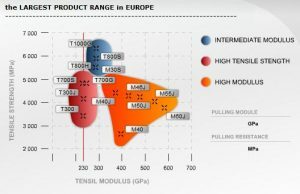 Below is a chart showing the ultimate tensile strength and modulus of different Toray fibres. It’s also worth keeping in mind that some of the less common fibres can be far more expensive due to the difficulty of sourcing them, and smaller production runs. T300 and T700S being the most commonly available. Figure 1: Show a selection of fibres available from Toray ranked against their UTS and Tensile Modulus. As mentioned above resin selection is a very important factor in achieving the best results for the final composite component, especially if this does not compliment the curing process being used. Resin can come in various formulations, designed for different processing situations and ultimately what the designer wants to get out of the resulting component. Although there are solutions to many of the varying features, benefits and pitfalls of the different types of resin system on the market. Below gives a ‘general’ overview for two types of resin system and some of their common features. Wet outs the fibre more easily at, allowing the manufacture to create a pristine surface finishes straight out of the mould. Even low-pressure curing process can be used to achieve good results, i.e. hot press, oven curing using vacuum only. Less tacky and easier to for the laminator to work with (although the percentage of resin impregnated into the fabric will also have an effect on the overall tackiness of the material). A caveat to A-class resin systems (when comparing samples using the same processing method) is a potential reduction in impact strength when compared up against toughened resin systems. Designed to be more impact resistant, generally with greater interlaminate shear strength according to manufacture test samples. Quite tacky making them a little harder to work with in warm laminating environment, but also great for applying the first ply to the mould surface, especially with a cold aluminium mould. Toughened resins are better cured in autoclave to get the pressure needed to fully wet out the laminate, during the curing process. If cured without adequate pressure, the component can become dry in it’s construction. Generally used for the manufacture of components that undergo their initial cure at between 80-150 °C and can then be post cured at high temperatures to achieve a higher glass transition temperature. Generally used for making composite mould tools, with an initial cure at between 45°C and 65°C and then a very slow ramp up to approximately 180°C to achieve a higher glass transition temperature than the component, that will later be made using that mould. One interesting option for customising pre-preg is the ability for the manufacture to impregnate the material with a bias. Thus, making one side of the fabric more impregnated than the other. This can be used for solving problem in certain situation where the laminate or mould design cannot change and there are issues with dryness on the surface of the component for example. Using a material with a 60:40 or 70:30 bias with the dry side facing the mould surface can often help draw resin towards the mould surface. One other useful application is with out of autoclave production. Having a dry substrate facing the away from the mould surface and in contact with the vacuum bag, makes it possible for the vacuum bag to slip more easily into position when air is being evacuated from the laminate. SCC have been fortunate to work on a huge variety of projects and we have therefore been exposed to an array of exotic materials and can offer some manufacturing know-how to aid engineers and designers in getting the best results out of their project. Ballistic fibres like Dyneema, Kevlar, Aramid, and Zylon tend be harder materials to trim and abrade for finishing, even when cured in the epoxy matrix. This is especially prominent when using rotary abrasive tools or hand fettling, because the fibre can become detached from the resin matrix and remain attached to the composite rather than falling away. This can sometimes be the case with like the ones listed above, that do not wet out as easily. One solution for improving the final finish, is to first cut away as much excess material as possible with a diamond disc and to then use a very high speed setting on a handheld rotary abrasive sanding sleeve / disc; and to reduce the contact time with the substrate, almost tapping at the surface. In the case of Dyneema for example, this combination of high speed and a tapping motion superheats the material, almost melting it’s connection with the component and at the same time flicking it away from the surface. This serves as both an effective and delicate trimming method for such materials. Achieving a pinhole-free finish is a careful balance of materials, cure time, pressure, temperature and in certain industries like Formula One where the production is leading edge, this process is often at times experimental. Pinholes and porosity can be an issue that needs to be resolved within project in order to achieve the best possible surface finish. If there aren’t any issues with a lack of resin in the composite and troubleshooting has been exhausted at the laminating stage. One solution for resolving this issue which follows the same principles as using a resin bias, is to use a material called Scrim on the surface of the component. This consists of a lightweight unimpregnated plain weave 50gsm glass fibre fabric, that helps to draw resin to the surface and allow air bubbles to evacuate from the mould surface. Once cured, this glass scrim can slightly dullen the surface, but is virtually invisible to the naked eye. If aesthetics are an issue then, the surface can be hand fettled and polished back to the raw composite. This can be a great option for achieving A-class finish on particularly trick components requiring short lead times and is a great lightweight alternative compared to paint finishing. That said, there are many ways to improve the surface finish of a component and SCC would always consult with the client before undertaking any remedial action that might affect the final product. If you’d like any more information on which materials might work best for your current or future projects. Whether you’re a new or existing customer, give us a call and we’d be happy to help you find the best materials and processing method for your application. Click here to get in contact.